You’d think that having a 1080p HDTV would be enough to display the best quality image money can buy. But no, HDTV isn’t as simple as that! 1080p HDTV refers to the image quality of the screen itself – feed a low quality movie to your swanky new high-def TV and you get, well, a low quality movie! Just as important as the quality of the HDTV is quality of the source (e.g. your cable or satellite broadcast, your DVD player, etc.) and the connector and cable that connect your sources to your HDTV. Each of these components acts as a chain, and a chain is only as strong as its weakest link. So, skimp on your connector or your source, and your picture quality will suffer, even with a 1080p HDTV. We’ll cover HDTV sources to look out for later, but for now, let’s concentrate on connections. In the old days, you’d simply connect your TV aerial to your TV with a bit of coax, and that was it. When videos came along, you also used coax to plug them into your TV. Everything was nice and simple. Even when SCART came out, it was simply a case of plugging your SCART cable into your TV from your video, DVD player or Set Top Box (STB), and although you can buy different quality SCART cables, the difference was never all that great, as non-HDTV is pretty poor even in its best suit and tie! All that has changed, though, as HDTV offers a plethora of different connectors for connecting your DVDs, PVRs, STBs and what-nots into your HDTV, each of which affecting picture quality to a greater or lesser extent. The following lists the different options in order of picture quality, with the first option being the lowest quality, and the last option offering the highest quality. Similar to coax in that it’s just a single-pin connector, it offers a slightly higher picture quality, but still pretty poor. It’s become the default connector for exotic sources, though, such as mobile phones and digital cameras. If you have a gadget that can output to TV, chances are it’ll at least use composite video, while virtually every TV set made for the past few years will also support it. Used with some STBs, DVD player and games consoles, it offers better quality than composite video, but still not good enough for HDTV. The preferred choice of some DVD players, interlaced component offers 480i resolution – that is, higher than the previous connectors, but interlaced. Now we’re heading towards HDTV quality. Progressive component offers 480p resolution, and is used by some better-quality DVD players. Still not actually at the HDTV level though. Very high quality, capable of 780p and 1080i resolutions, so we’ve reached HDTV level. Used by DVD players and some HDTV receivers. Also called VGA, this is the connector used by your graphics card to connect your PC to your monitor. It can also be used by some some HDTV receivers, video processors and projectors. Long the preserve of top-end camcorders and media editing devices, FireWire is capable of supporting content at the very highest resolutions: all the way to 1080i. VGA was designed for analogue CRT-based monitors, which is not much use when your display is digital (such as an LCD monitor or HDTV). DVI-D overcomes this by offering a fully digital channel between source and display, providing support for full HDTV resolutions. 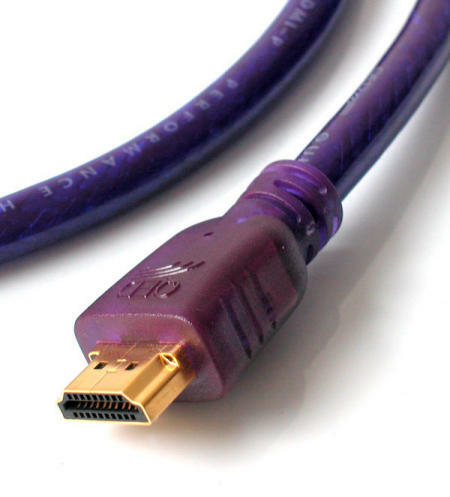 HDMI (see pic left and top) has become the de facto standard for interconnecting Hi-Def TV sources and displays. It supports standard, enhanced or high-definition video, plus multi-channel digital audio on a single cable, and has become the connector of choice for connecting PCs to home theatres. More details can be found at HDMI.org. So, why would you not use HDMI for everything, given that it offers the best picture quality? Well, your existing HDTV source, such as DVD player or STB, might not come with an HDMI interface, as the technology is relatively new. If this is the case, and you have a variety of different connectors with which to connect your sources to your HDTV, you might want to consider an A/V receiver. These come with an enormous amount of different inputs and outputs, so you can simply connect the receiver to your HDTV via HDMI, and then plug whatever source you’ve got into the receiver using whatever connector it comes with, and switch between the sources using your receiver. More details on the different connectors can be found at CNet. 5). HDTV Plasma TVs vs HDTV LCD TV – which is best? I want to know the circuit layout of hdmi to composite video.If i want to make a converter then what are the pin connections? Does the conversion requires addition of any capacitor and other stuffs? If so a detailed layout of the whole circuit.